ONCE MORE WITH FEELING: a little status goes a long way! a little status goes a long way! A little status can go a long way! I often "live post" during award shows on FB/Twitter. This Tony season was no different. I am always thrilled when something I say resonates with a follower/reader but I wasn't ready for response from a status that night. Not only was it "liked" over 3K, it was shared and shared and shared. To you, Singers/Actors coming to NYC to pursue theatre who have been told by your schools that if you don't "make it" before you're 25, you are done: do you SEE these Tonys? Do you SEE how the craft takes time? Do you see the actors OVER 50 winning & being nominated that have spent a lifetime pursuing craft, not fame? This is theatre. Relax. Enjoy the journey. You see, this year's Tonys really showed diversity, not just in ethnicity, but in AGE. All the leading & supporting acting categories were won by actors OVER 60!!!! And, with the exception of Cynthia Erivo, all the musical winners were not just actor/singers of color, they are all mid30s-mid40s! So, what was it about THIS status that resonated? Was it the fear of not doing enough? Was it the realization that what may have been told to you, directly or indirectly, from an institution you have attended, or a teacher or a coach, was wrong or at the least, was misleading? Or was it the permission to just enjoy the journey of your craft instead of pushing, fighting, and losing the joy? Honestly, I have no idea. I just speak the truth as I see it, as I feel it, and as I have experienced it. That status was, and is the truth. Perhaps it was simply because it was TRUTH that it resonated. I believe that all of us just simply need PERMISSION. We just need simple permission to BE. When that permission is reinforced by an outside source, it allows us to breathe, to smile, to take a step back and observe. As a teacher, I meet many young performers in NYC and elsewhere, with stars in their eyes and dreams in their minds, hoping for a chance to be on stage. I love that optimism and that youth-inspired energy! However, as a performer most of my life and as a teacher for about 30 years, I know that lack of experience needs to be focused and not trampled. I know how hard the business is. I see the hardship, the expectations, the fatigue, the unawareness, the push, the try, the frustration. I see the glitter rubbed off, and the stars get rubbed away. However, I also see those who then decide they will LEARN what it means to be an actor. They will LEARN what it means to be a singer. I see who commits to the process and who does not. Committing to the dream is only the first step; committing to the work to inhabit the dream is quite another and it's not for everybody. Committing to craft to "become" takes time, takes patience, takes stubbornness, takes awareness, takes absolute, unrelenting guts and focus. The journey is a lifetime. It's not a race to see who gets there first. It's not an expiration date. Recognition of your presence as an artist in the business, takes time. You build that recognition with your work, with your consistency, with your growth. The journey often reveals the time to "recover" and take unplugged time and space for yourself. "Go go go" does not necessarily make a well developed artist nor a strong craft. The journey has different speeds and many directions. It demands you to stay present to allow the speed and direction to reveal itself fully to you. By staying present, if that speed and/or direction changes, you won't miss it! When you buckle up for a flight, the pilot will come on over the intercom and give you a sense of length and altitude and approximate flight plan; then he/she says "so sit back, relax & enjoy your flight." So, before panic completely freezes you, before "I must" takes over your brain and spirit on a loop that is insanity, why not take a breath, and release it? Why not sit back and observe? Why not relax into this journey called craft and see where it wants to lead? We can choose to feel this choice a burden, or we can choose to explore the possibilities and enjoy it! The script is being written as you move into these possibilities; YOUR possibilities. Don't write the script before you have fully committed to NOW. The script is simply a first draft - just commit to re-writes as needed and demanded! Theatre isn't going anywhere. It will be there when your journey leads you to it. Theatre is about living, breathing, morphing, evolving craft. Theatre is about timelessness and mindfulness. 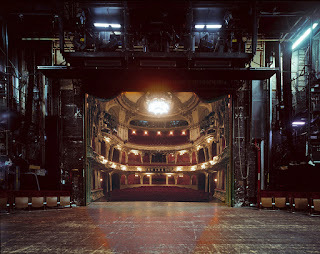 Theatre has no expiry date. The craft of theatre is not fame - it is a sense of inhabiting one's work. And on Father's Day, I leave you with my Dad's words: "We are never finished. There is always more we can do. But to be content in our lives & in our work, THAT is the key."